Bamberg is Beerparadise, I often say to customers. Or: Bamberg is Beercapital of the world. 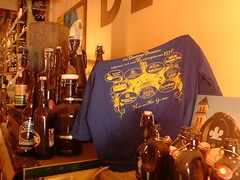 To continue with: They have 9 breweries in a town of 70.000 people. At those moments I talk with capitals & exclamation marks. & When you’re leaving Bamberg, I keep on about it, each village you visit has another brewery, or maybe 2. But not so long ago 1 of the 9 Bamberg breweries had to stop. Well, at least I have the T-shirt.